For rock and blues, this Schecter is a fine choice. Great sounds; good build and playability. Minor finish flaw at the headstock edge; tiny overhang as headstock face slopes away. Gibson first introduced its Les Paul Junior and Special models in 1954, aiming at players on a budget who aspired to trade up to the pricier Standard or Custom at a later date. The company certainly didn't realise what lasting appeal these instruments would have beyond this 'student' market, particularly the start-up Junior, which found its way into the hands of Johnny Thunders, Mick Ralphs, Bob Marley, John Lennon and Leslie West to name a few. Our review guitar calls to mind differing aspects of the Junior and Special's legacy. It is styled after the single-cut version (rather than the post-'58 double-cut 'revamp') with simple controls and traditional passive electronics. It addresses the traditional 'single-cut' issue of limited-upper fret access with similar offset, contoured neck-to-body joints (glued-in, of course), with 22-fret bound-edge rosewood 'board and medium jumbo frets. 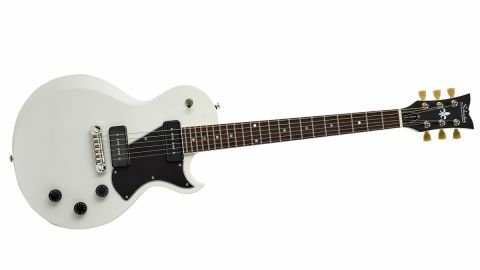 The Solo II Special has a highly sculpted body with a slim C profile three-piece mahogany neck, which all looks very smart but functional in its matt Vintage White Pearl finish. Even the black headstock face is finished in matt. First impressions of the Schecter are its light weight and slim neck - not that it feels at all flimsy. The three-piece construction and volute at the headstock 'wrist' make for a strong, stable-feeling neck with no tuning issues at all once the strings are settled in. This is no doubt helped by the quality Grover vintage-style tuners and TonePros wrapover bridge. The Tusq nut is well cut, and though perfectly seated, we can't help noticing a tiny overhang as the headstock face slopes away - nothing that would impede playing, intonation or tuning - and while we're looking, there's a tiny finish flaw at the headstock edge of this particular example, too. This Schecter is a quality-built instrument with a warm response and impressive sustain. Anyway, strumming a couple of chords before plugging in leaves us in no doubt that in all other ways, this is a quality built instrument with a loud and warm response and impressive sustain. Plugging in, this highly positive start translates to its amplified tone, complemented by the warmth and clarity of these surprisingly powerful USA-made soapbars. Reaching for the controls, it takes a few minutes to get used to their layout, because instead of the expected Gibson-style four-control layout we get bridge volume, neck volume, then a master tone. Pickup selection sticks to protocol with a shoulder-mounted three-way toggle switch. Into the green channel of a fairly cranked Marshall DSL, the volume controls prove very responsive, predictable and smooth in operation, helped by the handy rubber 'grip tip' speed knobs. The tone control is fine, too, although we're reluctant to tame the lovely, edgy cut of these pickups. They have slightly more output than your average vintage-style PAF and cover the stylistic gamut from nasty rock/punk rhythm in the bridge position, to a beautiful blues voice from the neck. The combined middle position, meanwhile, thins out the tone slightly for a little more twang. There isn't a sound here that doesn't impress. Overall, action and bends seem easy and comfortable, helped by the marginally flatter radius of the 'board. Everything from the sturdy three-way toggle switch, to the cleverly contoured body and metal jack plate give a reassuring impression that this guitar was designed to be played. And play it we did - for quite a while.